It is hard to see how an armed clash between Israel and Hizballah – or even Iran’s Revolutionary Guards and imported Shiite proxies – can be avoided in the light of their latest military moves in Syria, Prime Minister Binyamin Netanyahu warned President Vladimir Putin when they met at the Kremlin last Thursday, March 9. He pointed to the dangers inherent in the chain of new military bases (see attached map) Hizballah is building from north to south in the Syrian Qalamoun mountains. Netanyahu shot down Hizballah’s pretexts for this operation. They include the argument that the new bases will be a defense line for eastern Lebanon and the northwestern approach to Damascus, comparing them to Turkey’s grab last summer for over 6,000sq.km of northern Syria, as necessary for defending its own border. Israel’s generals view the bases as new Hizballah jumping-off points ready to attack their country at such time as Hizballah’s masters in Tehran see fit. He likewise rejected the “safe zone” scheme Hizballah’s leader Hassan Nasrallah and his bosses in Tehran have cooked up to cover the Qalamoun mountain bases and villages on the Syrian-Lebanese border. This was just a ruse, Netanyahu explained, to save those hostile military facilities from an Israeli strike. 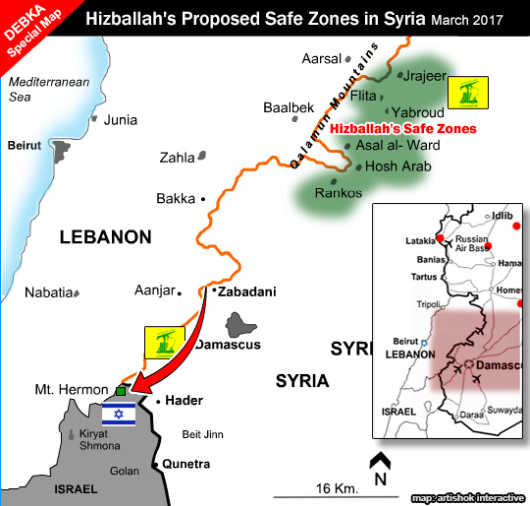 A glance at the map, said the prime minister, reveals the method by which Hizballah or Iran – or both – are working to achieve total control of the land bridge linking their expeditionary forces in Syria to Lebanon. However, the Russian president, though polite and friendly, showed little interest in his Israel visitor’s presentation, as our sources reported after their encounter. Five days later, Netanyahu understood why. On Monday, March 13, an armored Hizballah convoy with hundreds of soldiers was seen heading out of the Shiite group’s stronghold in Zabadani, which lies halfway on the Damascus-Lebanese highway, in the direction of the northeastern slopes of Mt Hermon, southwest of the Qalamoun range and close to the Israeli border. The roughly 30 villages situated on this mountainside are home to some Syrian rebel groups. Israel keeps them supplied covertly with arms, funds and medicines. Hizballah is clearly on the way to seizing control of those villages and so clear a path for another Iranian-initiated bid to occupy Quneitra on the Syrian side of the Golan border with Israel. DEBKA Weekly’s military sources report that the villagers have turned to Israel for urgent military back-up, but so far with no response. 1. By arming the Syrian rebels in those villages with heavy anti-tank weapons to block the Hizballah advance. 2. By deploying an Israel Defense Forces unit across the border to stand in the path of the Hizballah convoy. Thus far Israel has avoided openly sending troops into Syria. 3. By an air force bombing sortie against the convoy. Either of those steps may well spark a limited or wide-scale collision between Israel and Hizballah on Syrian soil.